Shaaauuuunnnnnnn! 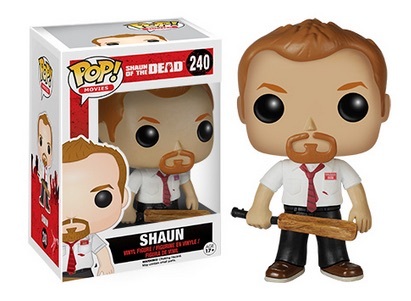 2015 Funko Pop Shaun of the Dead honors part one of the Cornetto trilogy with vinyl figures. The comedy-horror line includes options for both Ed and Shaun. Featuring Simon Pegg as Shaun and Nick Frost as Ed, Shaun of the Dead offers more comedy than horror, but manages to present it in a way that does not feel cheesy. The rom-com-zom movie has built a strong following over the years. In typical Funko Pop! fashion, the Shaun of the Dead figures for Ed and Shaun are both slightly generic and also easily recognized. Still wearing his Foree Electric name tag, Shaun wields his trusty cricket bat and even has a little red on him. 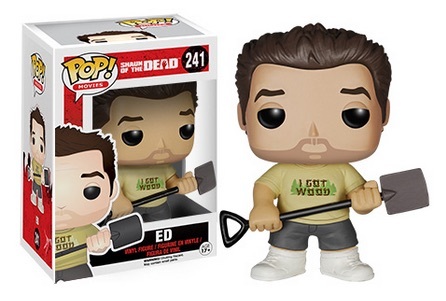 Ed comes complete with a shovel and I Got Wood t-shirt. The figures each measure approximately 3 3/4" and are numbered as part of the Pop! Movies line. The zombie flick is also featured in a larger Funko set for Vinyl Idolz. Click on the links to shop for figures on Amazon. FUNKO POP! 240 SHAUN OF THE DEAD.